← Book Review: Nowhere Child, by Rachel Abbott (Novella). Book Review: Three-Fingered Jack Davis, by D J Swykert. I have read a few other books by Author D J Swykert, so without knowing too much about this book I wanted to read it. I remember reading ‘The Death of Anyone’ by D J Swykert, and being so interested in the details of the book, I did an interview with the Author and asked him all about familial DNA, which was part of the book I had just read. When you know an Author does his research properly about the details in a book, it makes all their books more appealing. I went into ‘Three-Fingered Jack Davis’ of this opinion. I think if I hadn’t read previous books, the name of the book and the cover would leave me slightly unsure, but then reading the blurb I would be back fully on board again. So lets get down to my review! Three-fingered Jack Davis and Jesse James Hofstetler operate a dope house in Detroit. They sell some black tar heroin laced with carfentanyl, a drug used to tranquilize elephants, to a house full of addicts. Several of the addicts overdose and now Jack and Jesse are stuck with a number of dead bodies to deal with. The two men aren’t evil, not in the sense of a serial killer, but under the law they have committed murder. But they also have a very human side, Jack takes in a young addict named Posie and offers her protection, and Jesse saves the life of an overdosed girl called Imogene, who goes by the name of Im. Looking for refuge they hook up with Marielle, nicknamed Hell, a prostitute who owns a house of ill repute in the neighborhood. The lives of the five become intertwined as they are investigated by tough, but fair, Detroit homicide detective Bonnie Benham. The story proceeds through the perilous habitat of drug users, dealers and detectives to an unusual, but just, conclusion. 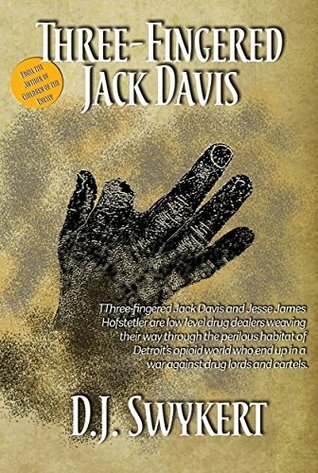 Three-Fingered Jack Davis is a gritty book that involves drug dealers, drug addicts, death through over dose and murder. It is far from a life like mine, but this is just the kind of book that I enjoy! Who wants to read a book that is too close to your own life. I want adventure, thrills and danger through fiction! D J Swykert gave me this once again. I was very pleased while reading this that the Author gave as much consideration to the real details in this book as he did with the last book of his that I read. Although I don’t know how drug addicts really feel, I felt that the descriptions given here were accurate and considered. Swykert writes his characters with understanding of all kinds of human knowledge, from the drug addicts who are aware of other humans to those that completly have no respect for human life. Although the two main characters Jack Davis and Jesse James are drug addicts and dealers, Jesse especially is written so that I grew to like him and root for him. It was nice to have Detective Benham back again. As before, she is fair but firm, gutsy but likeable. My favourite character was Hell. Hell becomes involved in Jesse and Jack’s difficulties through coincidence or fluke, but she sticks around and is a force to be reckoned with. We don’t know why Hell does all she does at first, but as we read on Hell’s character becomes more understandable to the reader. She was excellently written. Three-Fingered Jack Davis was both character and plot driven to give maximum impact. There is action right the way through the book, and we see all the characters develop as we read too. All too often, I can read a book that focuses on one or the other, either plot or characters. To write a really gripping book where the reader feels like they know the characters and are drawn into their lives through the plot takes a talented writer. D J Swykert has managed this with Three-Fingered Jack Davis. I will be reading more from this Author. It was a different kind of read, but very good. I totally get you Amanda: I also read books to experience things I normally wouldn’t in my real life. Plus books also make you see things from different angles, and sometimes even change your opinion on certain situations. I really enjoyed reading your review and I am glad you liked the book.